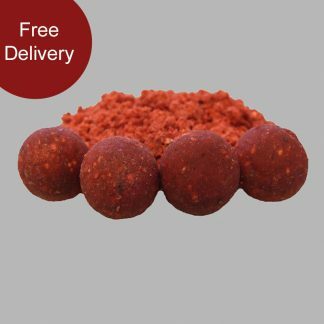 The Virus is a bait that has been developed to provide a true red fishmeal bait which will work all season long utilising the finest ingrediants and attractors avaliable. It has been through our extensive field testing program and has caught many fish to over 40lb from the U.K not to mention a string of big fish from foreign shores, including some massive river fish. The Virus contains LT94, pre-digested fishmeals, salmon extract, whey proteins, calcium casseinate, veg proteins and a blend of special spices in addition to an extremely effective feed stimulant that has come from the aqua-culture industry. The Virus airball pop ups have been specifically tailored for today’s modern rigs ensuring an unpresidented level of consistant bouyancy and minimal water absorption giving the angler confidence to leave their hookbaits out for the duration of their stay if needed. These very special pop ups have been made with the optimum amount of floatant for most rigs whilst maintaining high levels of basemix to replicate the free offerings and the exact same set of attractors as is found within our bottom baits providing an excellent alternative hookbait option. Included is a flavour booster liquid.